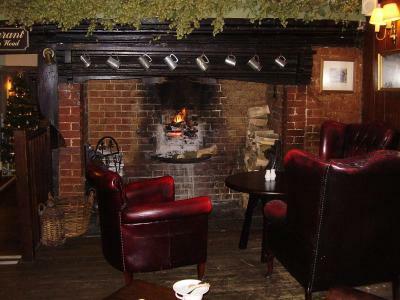 Lock in a great price for The Sun Inn – rated 8.8 by recent guests! Lovely big rooms. Smoked haddock for breakfast was delicious. The room was beautiful, the breakfast excellent, the building itself is beautiful. Exactly what we were looking for. The breakfast menu was excellent. 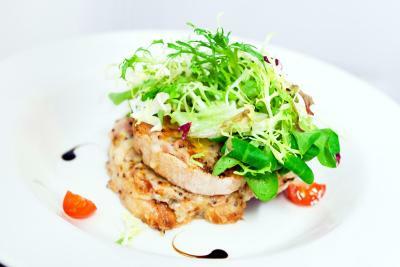 All the staff were very helpful and very friendly. Breakfast was outstanding - great selection and service. Restaurant went out of their way to cook me dairy free meal delicious. Lovely pub relaxing and full of character. Staff friendly and happy and helpful. 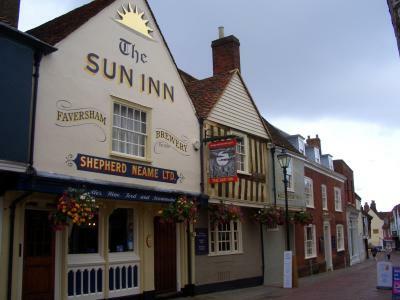 The Sun Inn This rating is a reflection of how the property compares to the industry standard when it comes to price, facilities and services available. It's based on a self-evaluation by the property. Use this rating to help choose your stay! 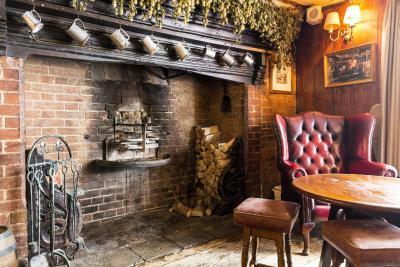 In Faversham’s historic center, this 14th-century Inn features rich character, original inglenook fireplaces, oak beams and a courtyard garden. 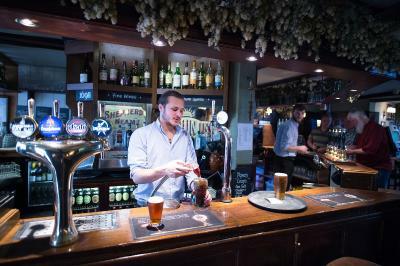 Its bar serves cask ales from the local Shepherd Neame brewery. Bright, colorful rooms at the Sun Inn each have a TV, radio, free tea and coffee and a private bathroom with a hairdryer. 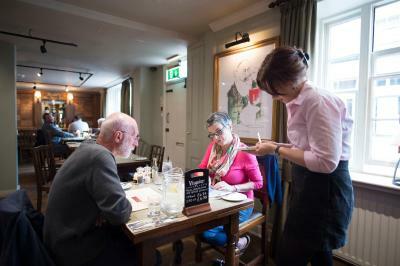 The Inn offers a varied menu of well-presented dishes that can be enjoyed in the bar, the courtyard garden or the classically styled restaurant. 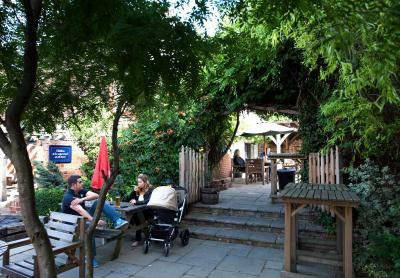 On Friday evenings, The Sun Inn hosts live music entertainment in its pub. 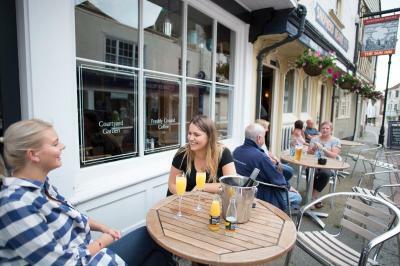 Local shops, restaurants and bars are all within a few minutes’ walk of The Sun Inn, while the scenic Kent coast is less than 2 miles away. Historic Canterbury is a 15-minute drive. 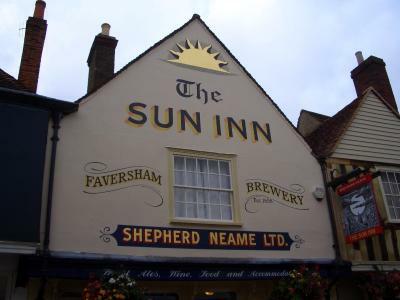 When would you like to stay at The Sun Inn? There are 7 double rooms with private bathrooms and one twin room with a private bathroom. Please state your preference at the time of booking. This large room comes with a desk, satellite TV and an private bathroom. This room features period charm and a private bathroom. This family room features period charm, a private bathroom, and enough space for a family of 4 guests. 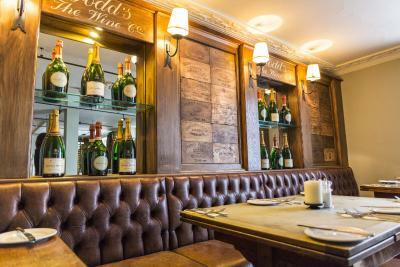 House Rules The Sun Inn takes special requests – add in the next step! The Sun Inn accepts these cards and reserves the right to temporarily hold an amount prior to arrival. All rooms are nonsmoking. 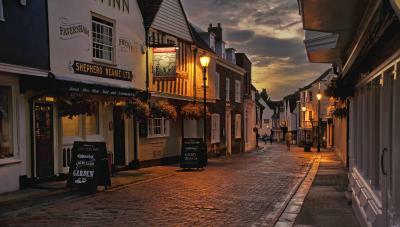 Please note we are a busy town center pub with rooms. The property hosts live music on Friday evenings. Some rooms may be affected by noise. 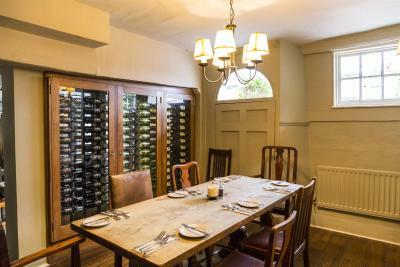 If guests would like a room away from the pub, then please contact the property for further details. Room 3 loo seat did not stay up - for men's use only of course! Slight mouldy areas around the bath - still there from last year! Charged us extra for breakfast saying only single occupancy on a booked double room ! The room was set outside of the building accessed by an external door. The heating was left on all night and it was uncomfortably hot. We returned to the pub just before 11 to be told we could not order drinks. As hotel guests this was very disappointing and staff did not go out of their way to assist us with any other option. For the money we paid I would expect better facilities and service. However location was good. The room we were in (8) was directly over the smoking area so we had to keep the curtains closed (not great when only one mild bulb for the room) and you can hear every conversation until 11.30pm when it closes. The rooms also run on a pump system (the same as on a boat) so anytime you run the tap, flush the toilet, have a shower the noise is very loud like a noisy coffee machine in your room. The staff are very friendly, the room clean and the breakfast nice. The bedroom doors banged shut very loudly and a few mornings we got woken really early which was annoying. It was a privilege to be able to stay in such an old building - around 700 years old - that's incredible. Really comfy bed, thoughtful provisions - toothbrush, razor, dressing gown etc. Powerful, hot shower over the bath. Amazing ceiling in room 11! Toilet seat in room was not fixed and one of it's supports were broken - plastic trash. Toilet roll holder was broken. Painted handrails on staircase were dirty and need either repainting or else stripping back to the grain. Door between restaurant and kitchen was very dirty with it being pushed and kicked open by staff with plates. Needs either replacing with proper such door else repainting and/or having large metal plates over the right places. Some carpets are just plain old and need replacing. Very steep stairs that might well defeat some elderly guests. Beds were very comfortable. Superb extractor in bathroom -virtually silent but v efficient. Spacious room. V warm, too warm. Plenty of room for storage etc. Could do with a little freshen up in the room interior as our ceiling in the bathroom was peeling away. The food is excellent here deffo want to come back for food again! polite nice friendly staff! Nice environment. No milk in the room for morning tea.